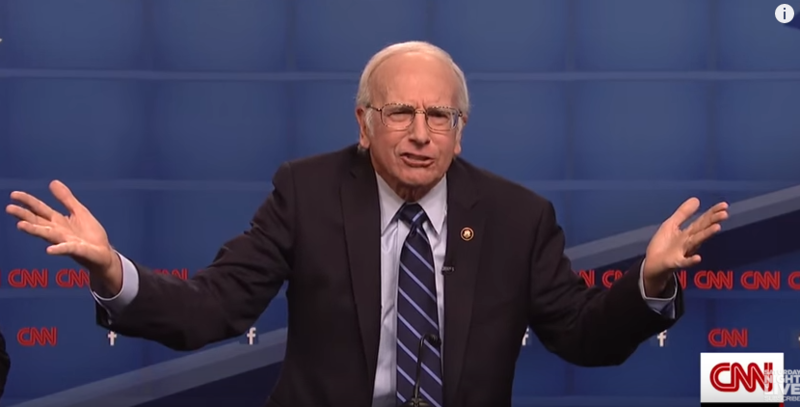 Larry David, the "social assassin" of Curb Your Enthusiasm and Seinfeld fame, just made the decision for Democratic presidential candidate easier, if for no other reason than we would get four more years of David impersonating Bernie Sanders on Saturday Night Live. During a parody of the Democratic debate, David stood alongside Alec Baldwin as Jim Webb and Kate McKinnon as Hillary Clinton as he nailed every Bernie-ism from the New York accent ("An-da-sen"), facial expressions and hand gestures. He touched on Clinton's emails, the fact that he's not a billionaire and, of course, the banks. Even Sanders thought the impersonation was spot on.